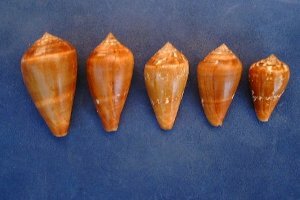 This article shows cones I have founded during a two years stay in Senegal (1990-1992). It is a tentative to illustrate as accurately as possible these species and to show the associate biota’s. For identification it use the help of the " Les cônes du Sénégal " publication by Marcel PIN and K.D. 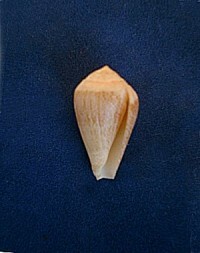 LEUNG TACK, publicised as a supplement of La Conchiglia n° 277, in 1995. 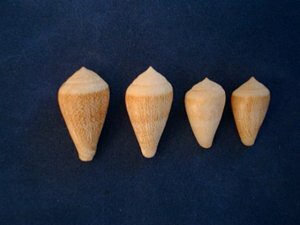 This document is the latest about this subject and even if the identification process of identification used is not widely accepted, mainly by the scientific old, it is still the most interesting publication concerning Senegal’s cones.. 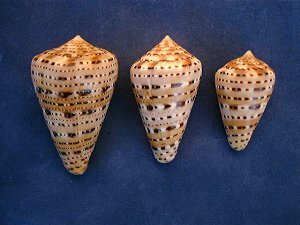 The other popular existing publication about cones shells, the " Cone shells " of Walls, is quite erroneous concerning the Senegal’s cones, as Marcel PIN says. The Yoff area, north of the peninsula with numerous rocks that's appears at low tide. The N’Gor area, where close to rocks piles, is a little sandy beach protected by the N’Gor island. The Almadies cape with rocks piles and two little beaches . The Ouakam area with high cliffs at the base of the higher Senegal’s hill " less Mamelles ", where some wide natural pools remains at low tide. The Fann area between Ouakam and Soumbedioun villages severely polluted an hardly beat by the waves. All long the corniche where are numerous little sandy bays with rocks piles and natural pools . This area is also quite polluted despite some hotels have their private beach here. 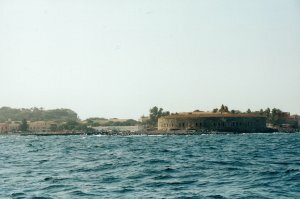 Goree island situated close off the Dakar port. Here is a little beach surrounded by rocky areas and some high cliff. It is probably the best spot for shelling but the pollution is coming and some times the visibility is very poor. The Bel Air cape is edged by two beaches , the public " voile d’or " is a popular beach but totally sterilised, and the private military beach with a long pier and some rocky places. 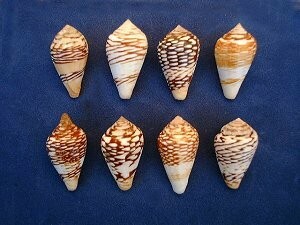 In all this area I never find any shell except beach ones. 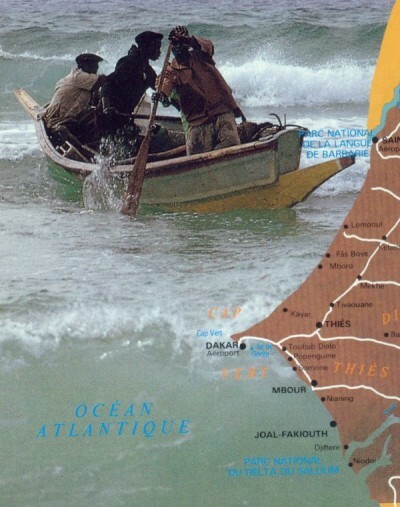 Southerly starts a large area which lays from the Hann bay to the Sine Saloum river mouth and then the very far Casamance province. On this " petite côte " some little villages like Popomguine, N’Gaparu, M’Bour and Joal Fadiouth allows to reach the sea side. Totally polluted between Hann and the cap des Biches this area only allows shelling at low tide and exceptionally by snorkelling with a very low visibility reduced to less than 20 centimetres Southerly the area is very rich (marginellas, helmets, volutes, murex, cones and even cypreae…), but the only means to catch them is by using trawlers or diving off shore on the rocky banks. Fishermen find very often interesting species that you can buy. Goree island one of the best diving spot of Senegal. where is a very popular diving place used by the Dakar diving club. Goree island. The old prison, now a museum. Here behind this place is a submarine rock masswhere you can find if you are lucky some beautiful sanguinolenta endemic or the cone unifasciatus that is described lower. In the far the Madeleines islands you can see from the Fann ClaudeL district. The island is a zoological reserve and the access is normally restricted. In the foreground you can find some C. unifasciatus but in very bad condition because the sea is often rough here. That do not, naturally, means that they do not exist. My investigations were probably outside their normal biotops. I’ve never investigated the Yoff area that is the normal breading zone of C. bruguieresis and C. mediterraneus as M. Pin says. On the other hand the Bel Air area becomes a real malacological desert. The only cone I found there was a big C. pulcher. 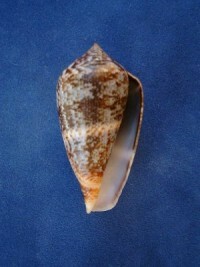 The C.belairensis is disappeared . 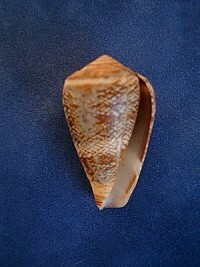 This cone is quite common in the north and west part of the Cap Vert peninsula where it is less numerous than c.tabidus and c. mercator. At low depth you can find it by free diving . I discovered a special one near 12 meters deep at the foot of the Ouakam cliffs. 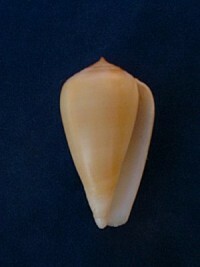 It is special by its elongate form and its special drawing (but is it an hybridus ?) . I have found some species bigger than 50 mm, maximum length as Pin says. with always present two clear bands at the lower third and at the shoulders level on the back. I only find two beached species on the " petite côte ". That is true, I never investigate the Popomguine area which is its birthing area as M.Pin says. I nevertheless received few specimens from local fishermen. 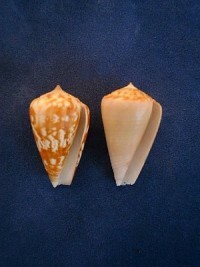 It is quite easy to make the difference with C. hybridus because it is more thicker with a lower spire and a more regular drawing, the two white bands are absent or quite obsolete. 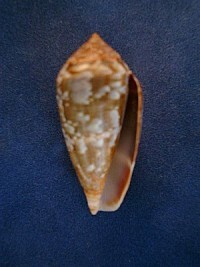 This kind small shell is present all long the north and west coast of the Cap vert peninsula. Very easy to find it lives in very little deep water. I never find it south of the N’Gor area while Pin says it was present nee Dakar city . It may be that is the result of the invading pollution ? It is easily recognisable despite a very varying drawing. 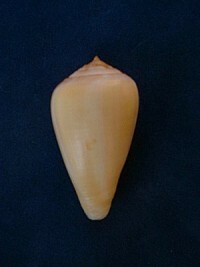 Typical form. L : 39.2 mm , l :22.2 mm. Sector de N’Gor (-0.5 metres). Different drawings. The juveniles have often very special drawings that become more classic when they become older. 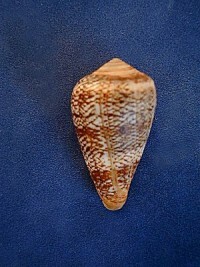 This cone which have been sometimes confused with C. mercator in the past is obviously very different with a general light brown pattern colour, more heavy, and presence of two clear bands at the first third and on the shoulders levels, even if the netting drawing and its general shape looks like this one. 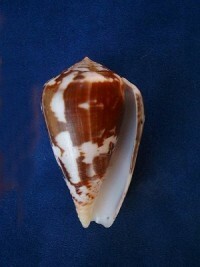 It is usually found on the petite côte area near N’Gaparou where the C mercator is absent. It is numerous at some period of the year (breeding time ?) half buried in the sand, close to the rocks. I have find this species at only one place, at the foot of the Ouakam cliff in a large natural pool at low tide. In this very restricted area there were numerous pieces to gather with some big C. ermineus in very bad state. 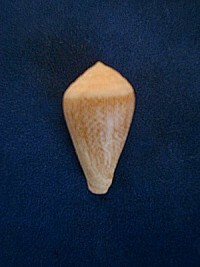 This little cone is quite easily recognisable and cannot be confuse with any other cone. It can be considered as quite rare. 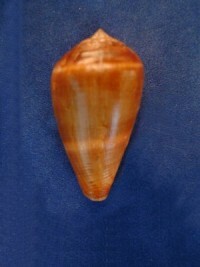 Very nice species in GEM condition are very rare. 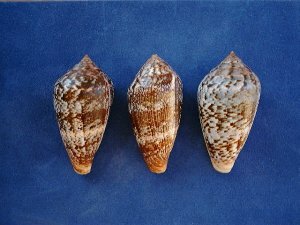 Typical C. cloveri L : 30.5 mm, l : 16.4 mm. I have some trouble identifying this species. 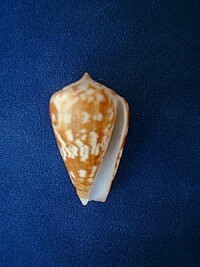 Those I collected are quite typical of the description by M.Pin. However the places where I found them are quite different . 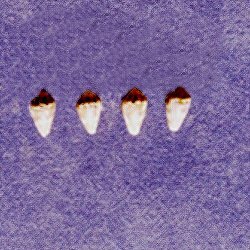 Pin says they are from the northern area of the peninsula, but mine comes from and area spread from the Ouakam village and Goree island where they do not inhabit with the other species that Pin says. On an other hand their maximum length exceeds largely the 40 mm that Pin quotes. ( 47 and 48 for the biggest). 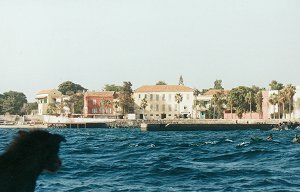 I have found a colony quite homogeneous both by its black brown colour an its light weight aspect in regard to the other, in a very narrow area in Goree island. 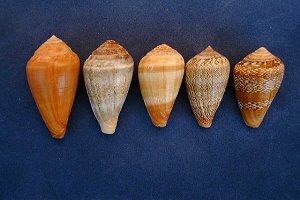 In fact it seems to me, that apart its colour and for some specimens its more thick appearance, this species looks like closely to C. hybridus : same shape and density, same length range, and presence of two white bands… ? 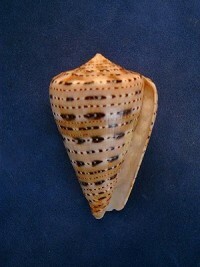 C.unifasciatus Fann area,( -0.5 metres). 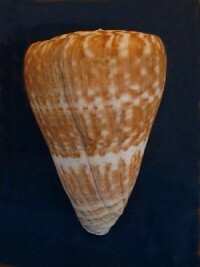 C . unifasciatus from Gorée ,( -1.5 metres). L : 48.3 mm , l : 27 mm. White bands more visible with some white spots at the bands level. 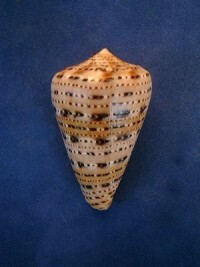 Serial of C. unifasciatus from Goree. 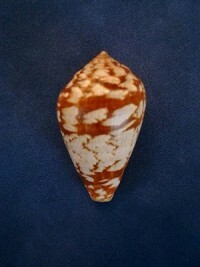 The white spots are more numerous on the small specimens. 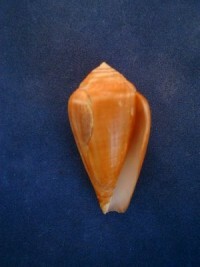 Serial of C. unifasciatus from the Ouakam/ Fann area. 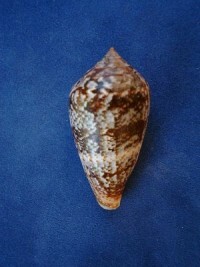 Some specimens are grey and finely reticulated. 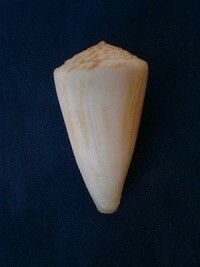 Here is a very beautiful cone with no identification problem. Its shape and drawing are very constant. 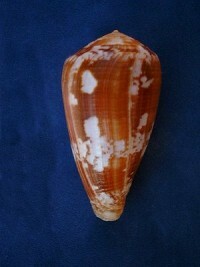 I only found one by diving at about 6 meters on a sandy bottom in Goree island. This is quite normal because it is usually found deeper. My other specimens come from fishermen on the " petite côte ". 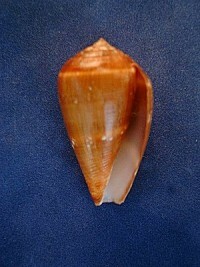 C. genuanus, dredged in Hann bay . L :57.6 mm . l : 35.5 mm . I did not found this species by myself. 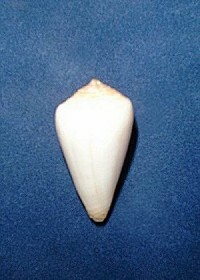 The specimen I have come from fishermen of the " petite côte " area. There are two forms. 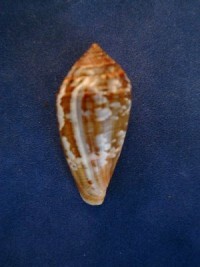 The small one have a smooth shell lightly coloured of pink brown. 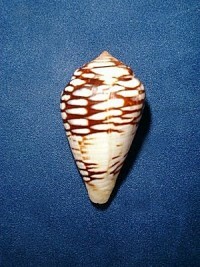 The big form has a white background with some brown longitudinal flames. On the two forms there are brown radial markings on the shoulders.
. L : 66 mm l : 35.5 mm. 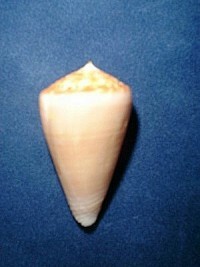 This small cone is quite common at small depth on all the Dakar peninsula except its southern part. 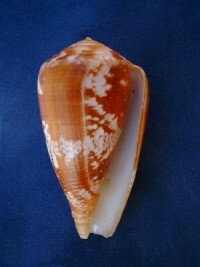 It lives often with C. mercator and C. hybridus. Small sized it is covered with a quite thick brownish periostractum ; There not any identification problem apart with the small specimen of C. ambiguus. 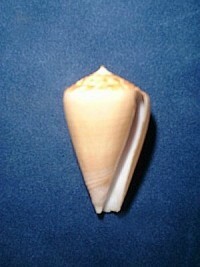 C. tabidus have rounded shoulders. The brown flames drawings are less numerous on the spire area. This beautiful cone is present on all the Cap Vert peninsula area and in the islands so called where I had the opportunity to go and dive. Its birthing area is probably wider and transatlantic. C. ermineus () is also present in the Caribian area. It has a wide range of length, colour and drawings ; Its biotop is also very variable. 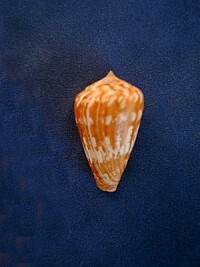 You can found it in very few depth waters at low tide as well as at depth closing 20 to 30 meters (off the petite côte). 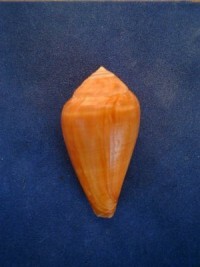 However its shape is always the same and it can be identified easily. Beautiful specimen dredged in the petite côte area. L : 71.8 mm , l : 38.6 mm. L : 62.3 mm , l : 37 mm . 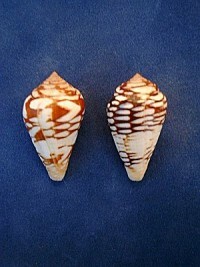 Specimens without drawing, yellow pattern ; dredged off petite côte. L : 52.7 mm , l : 29 mm. 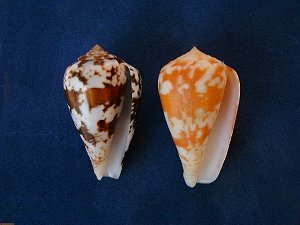 Recently described by Marcel Pin, it was named in honour of doctor Pinau, M. Pin’s friend, french radiologist from Dakar and great shells collector. They are both died recently. 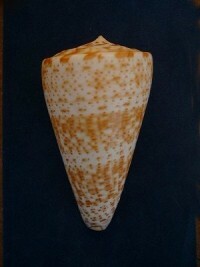 I had the opportunity to receive some rare species of this fine cone from the Dakar diving club director. Unfortunately only one remains in my collection, this explains the poor iconography. 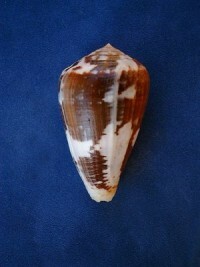 Collected by scuba diving off Goree at 20 meters, it is exactly identical to the M.Pin description. It do not looks like strictly to any other cone except, may be, to a C. ambiguus (the small form), witch had lost the drawings. 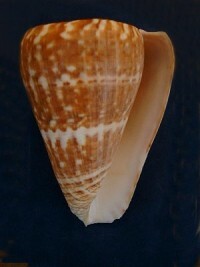 C. pinaui from the Hann bay ( 15 to 20 metres). 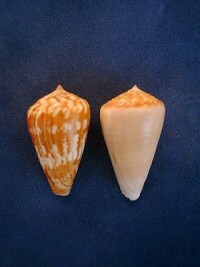 C. pinaui and C. ambiguus side by side. Questioning ? Probably the world biggest cone , C. pulcher is present every where in Senegal, where it do not reach the huge size that you can find southerly in the west Africa area. 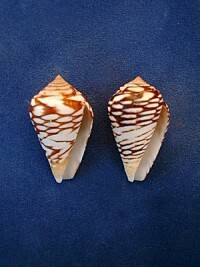 Juveniles specimens are more attractive because of their more brighter colours and drawings. The specimens I have collected by free diving between 0.5 and 12 meters in the Cap Vert area, are broader and heavier than the dredged specimens. 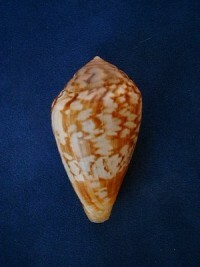 C. pulcher dredged off the petite côte, Narrow and lighter. 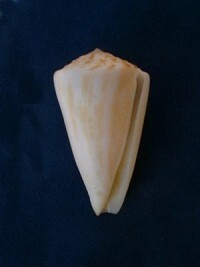 This cone is illustrated here but I had some difficulties due to its very short size to take pictures. 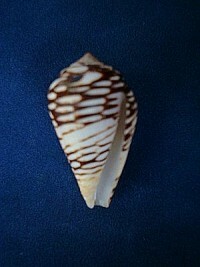 I have found 4 specimens of this tiny cone at the pointe des Almadies area, in little depth water. 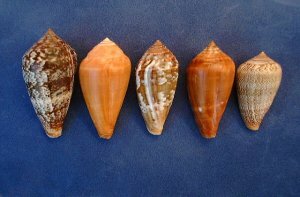 The shells are strictly identical to the description of M. Pin. 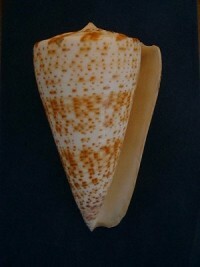 C. mediterraneus : I had the opportunity to see some specimens of this cone from the Alexandria area (Egypt), which resemble closely to the C. hybridus illustrated here. 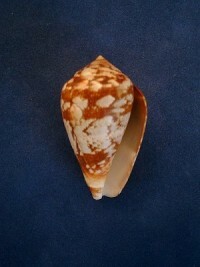 In an other hand the C. mediterraneus illustrated in the Pin’s study do not give any distinctive clues to make the difference with C. hybridus . 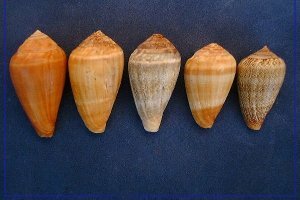 Considering that these cones are not living in the same places together, and that they are spread from north to south of the peninsula as follows : C. hybridus, C. unifasciatus, C. cacao, we are allowed to ask the question if it is not the same cone (why not C. mediterraneus ? ), with some variations due to the different biotops ? 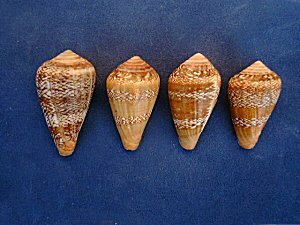 From left to right : C. hybridus, C. unifasciatus, C. hybridus, C. unifasciatus (Gorée), C. unifasciatus.